Canisius left wing Doug Beck tipped in a rebound with 5:32 left in the first period after Mitch McCrank one-timed a crossing pass from Kyle Gibbons for a power-play goal and a 1-0 lead. Air Force out shot the Golden Griffins 15-8 in the period but goalie Tony Capobianco started well and di not allow many rebounds. Canisius has a couple other good chances thanks to turnovers in the Air Force zone to keep AFA goalie Jason Torf busier that his seven saves suggest. The 19th-ranked Badgers play North Dakota for the last time this weekend in WCHA action, but their nonconference play will resume during the 2014-15 season. ‘Well, talked to Mr. Hrodey this morning, and he passed his cognitive test. That’s step one. He still has some residual headaches, so those have to dissipate before he can get on the bike. The Gophers beat writer says SCSU, Minnesota and Omaha have the best chance at the MacNaughton Cup regular-season title. 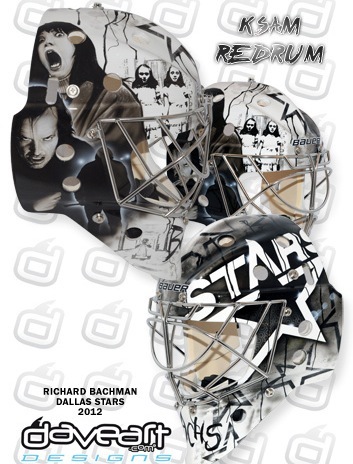 Former Tiger Richard Bachman’s “The Shining” mask, pictured, continues to draw rave reviews. Here is a brief look at the Atlantic Hockey Association race with an eye on the Niagara at Air Force regular-season finale. The latest USCHO.com poll is in as is the WCHA web media poll. 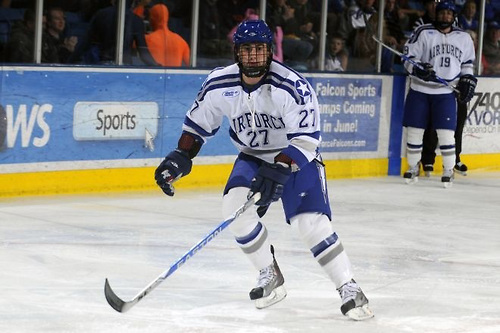 The Falcons’ special teams came up big as Air Force moved from fourth to a tie for second place in the AHA with a 2-0 home win Friday over Robert Morris. Goalie Jason Torf (30 saves) is why Falcons fans can again hope for an NCAA Tournament bid. Around college hockey, it was a tough night to be a top 5 team. Only idle No. 2 Quinnipiac did not lose. Here are recaps from the WCHA and about those upsets. GRAND FORKS — No. 15/16 St. Cloud State University men’s hockey team (15-10-0, 12-5-0 WCHA) took advantage of a dominant defensive performance to score a 3-1 victory at No. 5 North Dakota (13-8-4, 8-5-4 WHCA) on Jan. 25 in Grand Forks, N.D. The victory helped the Huskies move into sole possession of first place in the WCHA with 24 league points thanks to a 2-1 victory by No. 14 Minnesota State at No. 1 Minnesota on Jan. 25. The Gophers fell into second place tie along with Nebraska Omaha at 22 points. SCSU outshot UND 33-16 in the contest and also held it scoreless until a third period power play goal broke the shutout for the Huskies. In the first period, SCSU set the tempo by giving up only three shots on goal and followed with five shots allowed in the second period. SCSU freshman Jonny Brodzinski opened the offense with a goal at 4:15 of the first period while senior captain Ben Hanowski added the game winner with his ninth goal of the season at 16:36 of the first period. Freshman Kalle Kossilla assisted for his 11th of the season. MINNEAPOLIS – Minnesota’s 10-game unbeaten streak came to an abrupt end on Friday night after No. 14 Minnesota State’s Brett Knowles tallied the 2-1 game winner with 44 seconds left in regulation. For the first time in Minnesota’s last 10 games, the Gophers failed to reach the four-goal plateau although freshman goalie Adam Wilcox did his best to try and pick up the win regardless of the offensive production. The rookie netminder (16-3-4) made 31 saves – one off his career high – for his first loss of 2013. MSU goalie Stephon Williams recorded 37 saves to move to 13-6-2 this season. Despite Minnesota State’s third period goal, the Gophers held a 38-33 shot advantage and rallied from what would have been only the third time this season an opponent outshot the squad with 20 shots in the third period (the Mavericks had nine in the final stanza). Minnesota returns to action on Saturday in Mankato for the series finale against Minnesota State. Game time is set for 7 p.m. CT on FOX Sports North PLUS. BEMIDJI — Nebraska-Omaha got two goals and an assist from Matt White while Johnnie Searfoss and Jaycob Megna each pitched in a goal and helped on another to help the Mavericks hold off a late charge by Bemidji State and earn a 5-3 WCHA victory at Sanford Center Friday. MADISON — Junior forward Michael Mersch posts two goals and an assist while Mark Zengerle and Nic Kerdiles scored a goal and an assist each to lead Wisconsin to a 5-2 victory against Alaska Anchorage on Friday night at Kohl Center. CHESTNUT HILL, Mass. 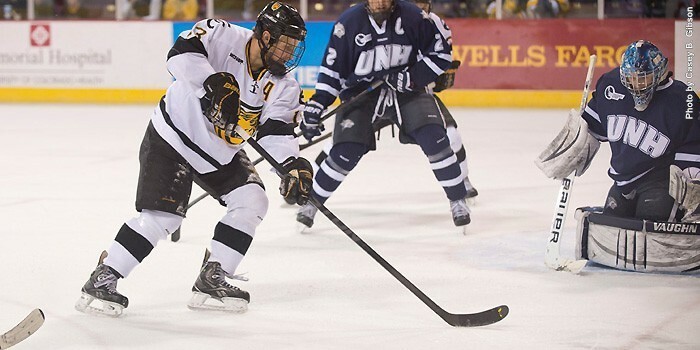 — On paper, it was a mismatch – Hockey East’s top team against the league’s cellar-dweller. Maine flipped that mismatch on its head, however, in defeating third-ranked Boston College 4-1. In pulling off the upset, Maine spoiled the return of BC coach Jerry York to the bench after missing four games while recuperating from surgery for a detached retina. Martin Ouellette stopped 34 of 35 shots including all 20 in the second period when BC threatened on three power plays. He also benefited from a goaltender’s best friend, the pipes behind him, as the Eagles twice clanged iron. The Black Bears, who hadn’t scored more than two goals in 20 of 23 games this year, took a 2-0 first-period lead, expanded it to 3-0 in the second, and after BC closed the gap to 3-1 in the third, added an empty-netter for the final margin. “Frankly, we got some puck luck, which we perhaps haven’t had a lot of,” Maine coach Tim Whitehead said. “It could have been very different if we hadn’t had some of those bounces. NORTH ANDOVER, Mass. — After taking a brief 2-1 lead in the second, UNH allowed two unanswered Merrimack goals. The game-winner came from freshman Brian Christie, who started the third period by winning the opening faceoff, driving the middle and netting a marker through a defender’s legs just seven seconds into the final frame from captain Jordan Heywood and junior Mike Collins. Collins and Christie both finished with three points on the night and Merrimack held the Wildcats scoreless for the remaining 19:53, winning 3-2. Of note from the CCHA: No. 9 Western Michigan defeated Michigan to take sole possession of first place and Miami beat Bowling Green to give RedHawks’ head coach Enrico Blasi his 300th career win. The RedHawks are now in second place while Notre Dame, losers in its last five, fell to third. Also, this columnist tells us why Mandi Schwartz still matters to her teammates, loved ones and Yale. The Gazette’s David Ramsey talks about CC goalie Josh Thorimbert’s season. Both the Tigers and the visiting Minnesota Duluth Bulldogs know how big this series is for home playoff ice. The buzz about the No. 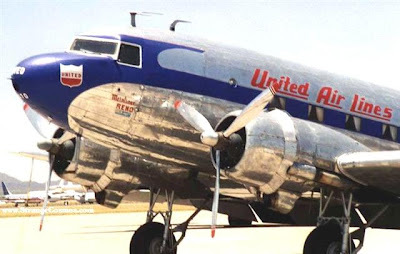 6 North Dakota at No. 1 Minnesota series is reaching a fever pitch. Here are links to everything you need to know from the Grand Forks Herald. The Mankato Free Press provides plenty of links about the other series. Two future CC players were among the 19 future NCHC student-athletes who made the NHL Draft midterm rankings. Here are short previews on the future NCHC schools in action this weekend. Here is the Air Force preview for its Saturday-Sunday road series at last-place Sacred Heart. 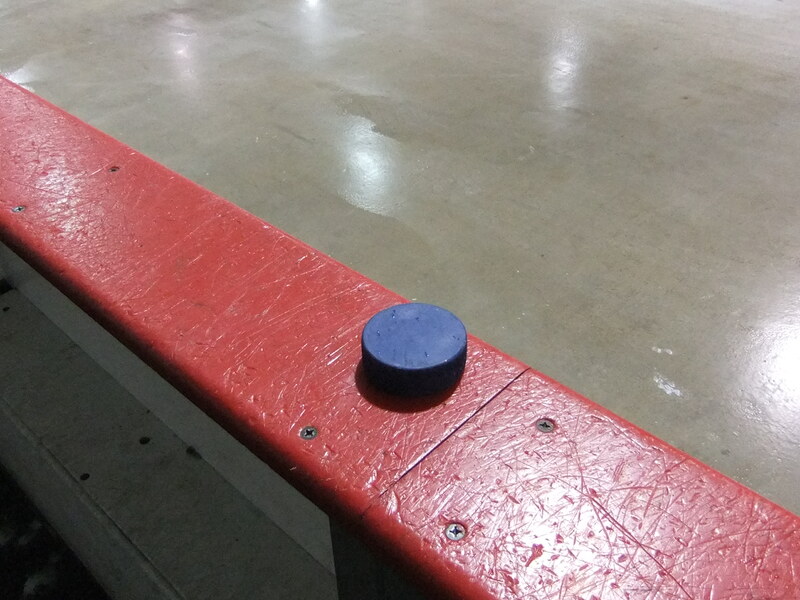 This news made my Thursday: Here is more on the Alabama-Huntsville joining the WCHA from the Huntsville paper and details from USCHO which broke the news. There were some concerns that the travel subsidy and the fact that this means one less trip to Alaska each season apparently eased. It was also a good night for me personally since I got to cover an outdoor club hockey game. Cold but a lot of fun. It was a good reminder what makes hockey such a great sport to be around.